From September 2001 to September 2004, B.Sc. in Electronic and Communications Engineering (Hons), Nahrain University , Iraq. From September 2004 to December 2007, M.Sc. in Modern Communications Engineering, Nahrain University , Iraq. From January 2011 to May 2014, Ph.D. in Communication Engineering, University Malaysia Perlis (UniMAP) , Malaysia. 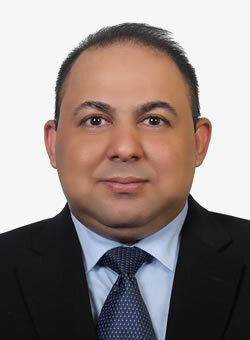 From February 2006 to July 2008, CDMA-BSS and PS Maintenance Team Leader , Huawei Technologies Company, Sulaymaniah, Iraq. From September 2008 to October 2010, Senior BSS Engineer , Omnnea for Wireless Telecommunications, Baghdad, Iraq. From September 2011 to November 2013, Graduate Assistance , University Malaysia Perlis, Perlis, Malaysia. From April 2014 to March 2015, Post Doctoral Research Fellow , Universiti Teknologi Malaysia, Johor, Malaysia. From September 2015 to now, Lecturer & Head of Computer Communication Networks Branch , Computer Techniques Engineering Department, Al-Mustaqbal University College, Babylon, Iraq. Hamza M. R. Al-Khafaji, S. A. Aljunid, and Hilal A. Fadhil, “Improved BER based on intensity noise alleviation using developed detection technique for incoherent SAC-OCDMA systems,” Journal of Modern Optics, Vol. 59, No. 10, pp. 878–886, 2012. H. M. R. Al-Khafaji, S. A. Aljunid, and H. A. Fadhil, “Spectral efficiency analysis of bipolar spectral-amplitude coding optical code-division multiple-access systems using different one-dimensional codes,” IET Optoelectronics Journal, Vol. 6, No. 5, pp. 215–222, 2012. Hamza M. R. Al-Khafaji, S. A. Aljunid, Angela Amphawan, and Hilal A. Fadhil, “Improving spectral efficiency of SAC-OCDMA systems by SPD scheme,” IEICE Electronics Express, Vol. 9, No. 24, pp. 1829–1834, 2012. H. M. R. Al-Khafaji, S. A. Aljunid, A. Amphawan, H. A. Fadhil, and A. M. Safar “Reducing BER of spectral-amplitude coding optical code-division multiple-access systems by single photodiode detection technique,” Journal of the European Optical Society, Vol. 8, 13022, 2013. Hamza M. R. Al-Khafaji, S. A. Aljunid, Angela Amphawan, and Hilal A. Fadhil, “SOA/SPD-based incoherent SAC-OCDMA system at 9 × 5 Gbps,” IEICE Electronics Express, Vol. 10, No. 5, 20130044, 2013. Hamza M. R. Al-Khafaji, S. A. Aljunid, Angela Amphawan, Hilal A. Fadhil, and Anuar M. Safar “Phase-induced intensity noise reduction with improved group velocity dispersion tolerance in SAC-OCDMA systems,” International Journal of Engineering and Technology (IJET), Vol. 5, No. 1, pp. 95–100, 2013. Hamza M. R. Al-Khafaji, S. A. Aljunid, Angela Amphawan, Hilal A. Fadhil, and Anuar M. Safar “APD gain effect on SAC-OCDMA system using Modified-AND detection technique,” Journal of Theoretical and Applied Information Technology, Vol. 53, No. 3, pp. 467–471, 2013. Hamza M. R. Al-Khafaji, S. A. Aljunid, and Hilal A. Fadhil, “Spectral efficiency comparison of SAC-OCDMA systems using unipolar and bipolar encoding techniques,” IEEE 2nd International Conference on Photonics (ICP 2011), Kota Kinabalu, Malaysia, art. no. 6106822, pp. 89–93, 2011. Hamza M. R. Al-Khafaji, S. A. Aljunid, and Hilal A. Fadhil, “Spectral efficiency of unipolar SAC-OCDMA system considering noise effects,” IEEE Symposium on Industrial Electronics and Applications (ISIEA 2011), Langkawi, Malaysia, art. no. 6108702, pp. 218–222, 2011. Hamza M. R. Al-Khafaji, S. A. Aljunid, and Hilal A. Fadhil, “Performance enhancement of SAC-OCDMA system using Modified-AND subtraction detection,” IEEE International Conference on Computer Applications and Industrial Electronics (ICCAIE 2011), Penang, Malaysia, art. no. 6162170, pp. 412–415, 2011. Hamza M. R. Al-Khafaji, S. A. Aljunid, and Hilal A. Fadhil, “Improved probability density function using Modified-AND detection technique for incoherent SAC-OCDMA systems,” IEEE 4th International Conference on Computer and Communication Engineering (ICCCE 2012), Kuala Lumpur, Malaysia, art. no. 6271234, pp. 531–534, 2012. Hamza M. R. Al-Khafaji, S. A. Aljunid, Angela Amphawan and Hilal A. Fadhil, “Triple-play services using different detection techniques for SAC-OCDMA systems,” IEEE 3rd International Conference on Photonics (ICP 2012), Penang, Malaysia, art. no. 6379819, pp. 350–354, 2012. Hamza M. R. Al-Khafaji, S. A. Aljunid, Angela Amphawan, and Hilal A. Fadhil, “Enhanced probability density function using APD in SAC-OCDMA systems based SPD technique,” IEEE Symposium on Industrial Electronics and Applications (ISIEA 2013), Kuching, Malaysia. Hamza M. R. Al-Khafaji, S. A. Aljunid, and Hilal A. Fadhil, “Single photodiode detection for interference elimination in SAC-OCDMA systems,” IEEE 4th International Conference on Photonics (ICP 2013), Melaka, Malaysia, art. no. 6687061, pp. 41–43, 2013.